Newsletter #942: The "Great Ideas from Tech Stuff" Issue | Andy Sernovitz | Damn, I Wish I'd Thought of That! We like to focus on smart marketing that anyone can pull off — whether you’re a candlestick-maker working out of your garage or a VP of marketing at a big brand. So even though we don’t always talk about techie, mobile, or digital marketing techniques, there’s still a lot you can learn from these examples. When Google demoed their Documents collaboration feature, they wanted it to be an experience people would talk about. So when users start typing in this demo, they’re not just collaborating with generic bots — they’re writing a Google document with Edgar Allan Poe, Charles Dickens, and William Shakespeare to name a few. After Shakespeare’s rewritten your “have’s” to “hath’s” and Poe’s added some foreboding phrases, Google lets you share a short animation of your collaboration. That’s a remarkable (and oddly intimidating) hands-on experience that people will share with their friends. The lesson: Is your product demonstration living up to the excitement you want your customers to feel when they use it? To get the right job applicants for open tech positions, some companies are looking for them in their natural habitats: HTML codes. Both Flickr and Microsoft have hidden secret messages to let the people reading their source codes know they’re hiring. Discovering that kind of exclusive message gives tech folks something to share with their friends — and gets the companies’ recruiting messages to the right audiences. 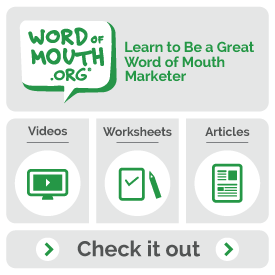 The lesson: Job ads are just one more opportunity to inspire word of mouth. How can you use yours to get people talking about your company? The lesson: Take the extra steps you need to let your customers know you understand them and you’ll do anything to help make their lives easier. This site lets you see where people are editing Wikipedia in real time and follow their changes as they happen.